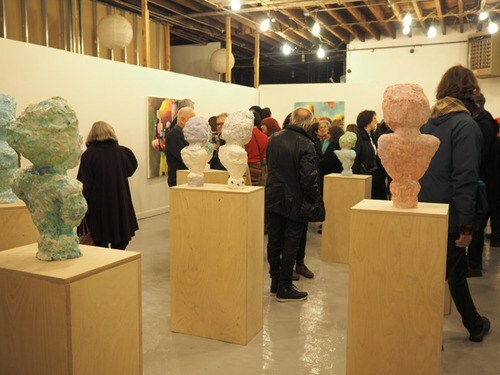 Typically, crowded openings are not an ideal setting for experiencing the artwork on display. 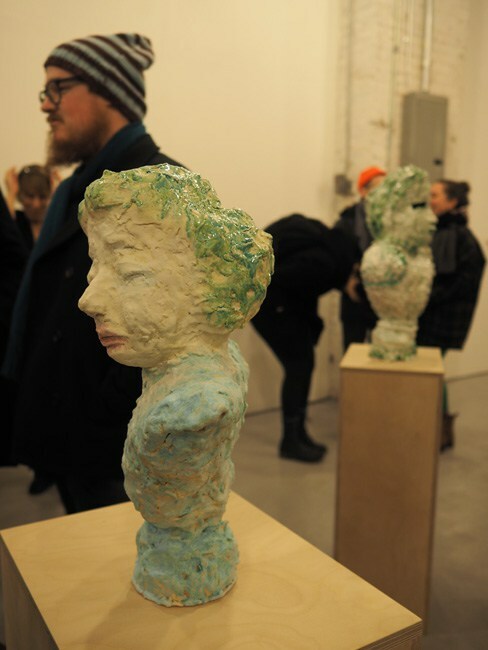 Nevertheless, the current show at Storefront Ten Eyck, featuring Elise Siegel’s ceramic busts paired with Mie Yim’s abstracted figure paintings, thrives in a crowded space. As in a theatrical experience or a ritual ceremony, the visitors’ presence enhances the psychological tension that these artworks emit. Fascinated by the transformative nature of human interactions with objects, Siegel compares her role as a sculptor to that of a puppeteer: “Once the puppet comes alive, it’s not really clear who’s in charge,” she explains. This process begins with a size or stylistic trope in mind. 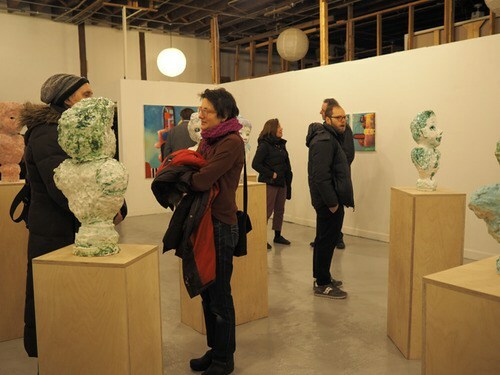 As the piece develops, she gets a glimpse of who the figures might be, not as portraits of specific people, but rather as distinct imaginary individuals. 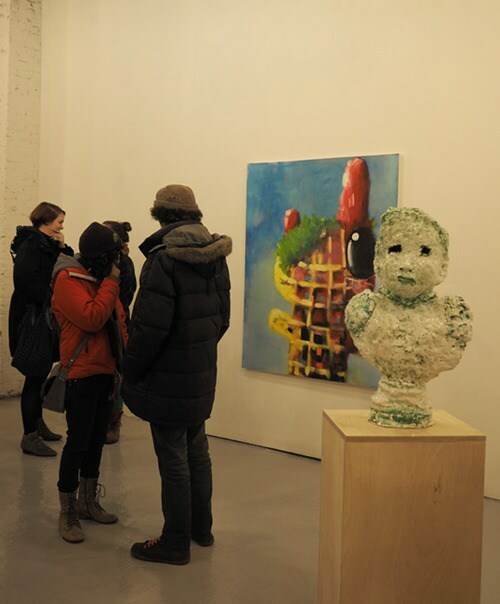 Siegel explains that she is particularly drawn to figurative sculptures that humans have empowered, such as idols, reliquaries, masks, and even toys. 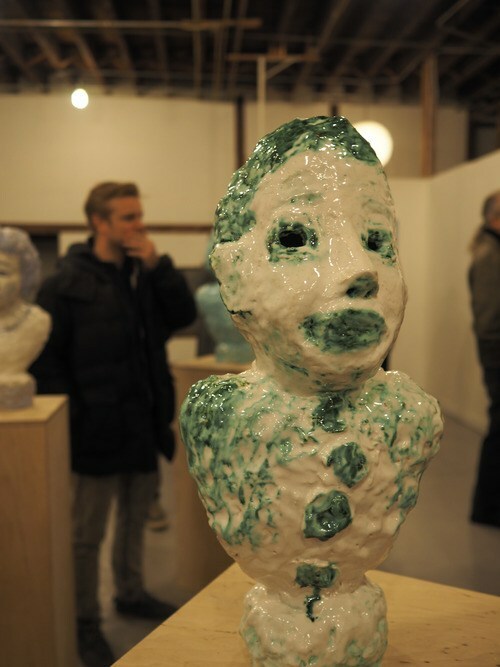 “I have taken formal cues from the abstracted features and exaggerated forms of the amazing Jomon dogu figures of Neolithic Japan as well as the hollow window eyes of terracotta Hawaiian funeral figures from the third to sixth century,” she elaborates. slightly smeared pink lipstick and closed eyes, this female figurine conveys complex and opposing states of being. “For me, this piece is looking inward,” Siegel reflects. glaze with copper oxide in a gestural way, allowing it to melt and run. Similar to Siegel’s method, Mie Yim’s approach is intuitive, experimental, and deeply personal. 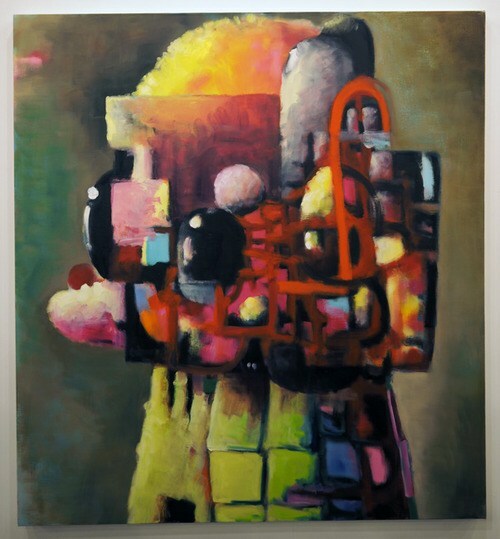 With a skill and sensibility of an abstract expressionist, Yim begins by pushing paint. She notes, “Shapes emerge; the doll-like eyes anchor the form and turn into a portrait…If it’s all going too swimmingly, I have to ruin it, again. In order to find it, you have to lose it.” This process of building and erasing is evident in her lush and layered canvases. 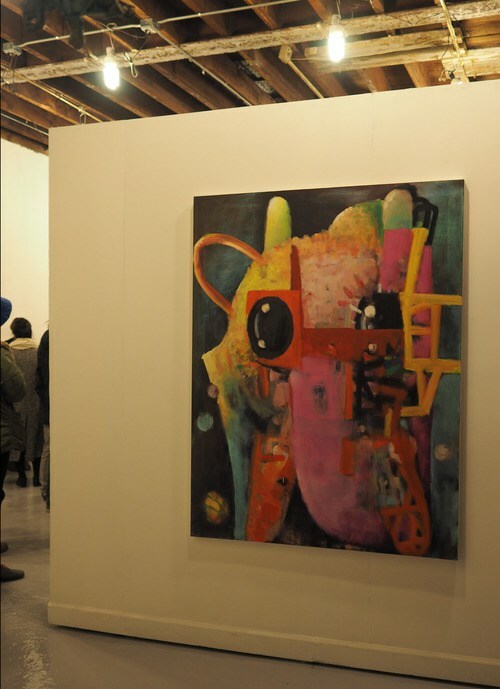 As with Siegel’s sculptures, Yim’s paintings convey a sense of fleeting moments, changing moods, and forms in flux. With a winking nod to traditional Western portraiture, her forms are well defined in the foreground, while her saturated palate alludes to “distant cousins of Hello Kitty and other Asian pop culture dolls that are having an existential crisis,” as she puts it. 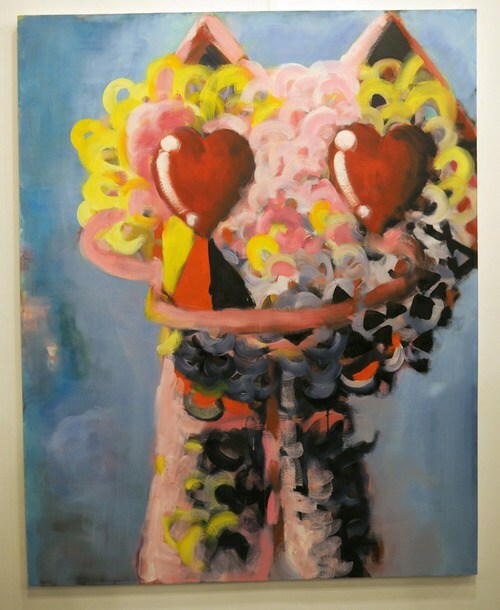 Yim, a native South Korean who resides in New York, successfully conveys in her paintings the intersection between East and West, abstract and figurative, cute and aggressive. In other words, “me,” as she sums up.